Did we mention it's a guzzler? Think twice about the turbo engine. It’s peppy but thirsty. The 2020 Kia Sportage is refreshed, stylish, and competitive as ever, though its fuel economy is poor. 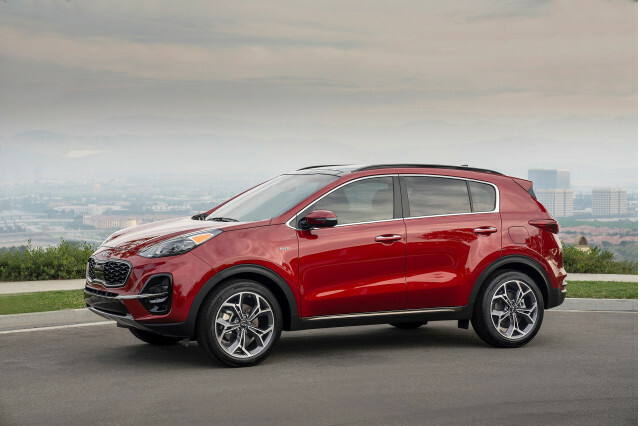 The Sportage was updated for 2020 with a sporty looking S trim, new headlights, wheels, a redesigned front and rear bumper, and more standard equipment including an 8.0-inch touchscreen with Apple CarPlay and Android Auto compatibility. The 2020 Sportage is offered in LX, S, EX, and SX trim levels. The styling tweaks to the Sportage work well to keep this crossover SUV contemporary against a redesigned Ford Escape and Toyota RAV4. The interior features fine materials on high-trim versions, but the base LX can feel a little chintzy. The Sportage is powered by either a 181-horsepower 2.4-liter inline-4 or a 240-hp 2.0-liter. Front-wheel drive is standard and all-wheel drive is optional, teamed in every configuration to a 6-speed automatic transmission. Though slightly smaller than some of its popular competitors such as the Honda CR-V and Toyota RAV4, the Sportage packs plenty of space for people and stuff with 31 cubic feet of cargo room behind the second row and just over 60 cubes with the rear seats folded flat. The Sportage is also quiet on the road for a mainstream crossover, though the standard engine produces an unsavory noise at full tilt. Thanks to Kia’s trim level and option packaging, selecting a Sportage is as simple as choosing how much you want to pay and what color you want it to be painted. Turbo and all-wheel-drive models naturally cost more, but not prohibitively so. For 2020, the Sportage gains active lane control, automatic emergency braking with pedestrian detection, automatic high-beam headlights. Blind-spot monitors are optional. Fuel economy is one area where the Sportage doesn’t stack up. 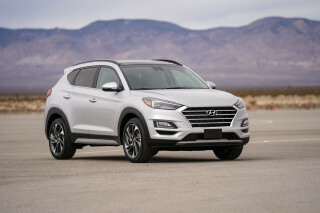 The thriftiest model is the base front-wheel-drive Sportage at 26 mpg combined, while the turbo-4 drops that figure to just 21 mpg combined with all-wheel drive. The 2020 Kia Sportage looks better this year thanks to tweaked front and rear bumpers. A long wheelbase and short overhangs combine to give the Sportage a planted look, and while all-wheel-drive models have additional ground clearance at the bumpers for a more rugged look, we like the style of any Sportage, especially after the refresh this year. New wheels give the Sportage a more contemporary look, and the full-width taillight design is trendy but undeniably handsome. The Sportage’s cabin is among the top of its class, with a clean, European-looking design that’s rife with soft-touch materials and high-quality surfaces in most places. The newly standard 8.0-inch touchscreen for infotainments takes center stage and is flanked by air vents and underlined by redundant buttons. Unfortunately, all this style comes at the expense of outward vision, as the Sportage’s pillars are large and cut off a lot of the view rearwards. The 2020 Kia Sportage can do its name justice with sharp handling and optional turbo power. 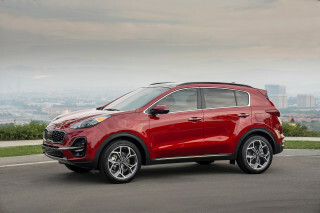 2020 Sportage LX, S, and EX trims come standard with front-wheel-drive and a 2.4-liter inline-4 that makes 181 hp and 175 lb-ft of torque. A new S trim adds sporty visual intrigue but is paired with the base engine that’s light on power and refinement but does return better fuel economy than the turbo. All-wheel drive is optional across the range, and a 6-speed automatic transmission is standard no matter what’s underhood. 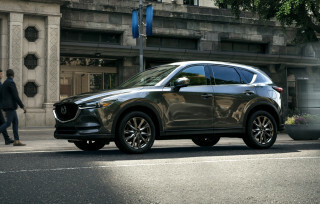 The top-tier SX trim includes a 2.0-liter turbo-4 that makes a respectable 240 hp and 260 lb-ft giving it more than enough grunt for highway passing maneuvers. Regardless of trim, the Sportage is a competent handler and has a composed ride over long distances, with a surprisingly quiet cabin. Sportage LX crossovers are the softest thanks to 17-inch wheels, but EX models are only slightly stiffer. The SX model has firmer springs, different dampers, and tweaked steering for a different personality to go along with its turbo power. It’s sporty, but only to a point. While all-wheel-drive models get a revised front bumper that increases ground clearance, this is no off-roader. The all-wheel-drive system performs adequately in slippery conditions, albeit with a fuel economy penalty, so consider whether you really need it before checking the box. The 2020 Kia Sportage is slightly smaller than competitors but makes use of its space well for both people and stuff. Even the base Sportage LX and S have a smattering of soft-touch surfaces that are pleasingly buttoned-down, while EX and SX trims replace the cloth upholstery with leather that feels a cut above its price bracket. A manual power driver’s seat is standard with the option for a 10-way power-adjustable version higher up the trim tree. Rear seat passengers may feel a bit claustrophobic with the Sportage’s high beltline, but there’s plenty of space for two adults or three in a pinch. The Sportage also delivers solid cargo space despite being smaller than some of its competitors, with 31 cubic feet behind the rear seats and a hair over 60 cubes with them folded flat. The cabin is remarkably quiet during normal driving, though the rasp of the base engine at full tilt is both intrusive and annoying. While crash tests aren’t complete yet, the 2020 Kia Sportage boasts good scores and more safety features for this year. 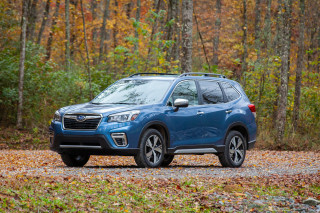 The federal government rated both the front- and all-wheel-drive versions five stars overall, though the model earned just four for the front driver’s side and rollover tests. While the IIHS hasn’t gotten to the 2020 model yet, the 2019 model received “Good” ratings all around minus the headlights, which Kia have redesigned for 2020. We’d be surprised if that score doesn’t improve. Active safety tech is standard across the board. The 2020 Sportage comes with, a rearview camera, lane-departure warnings, rear cross-traffic alerts, automatic emergency braking, and active lane control. Blind-spot monitors are optional. The 2020 Kia Sportage delivers on value as usual, though the features you really want do cost a decent amount more. The LX model provides the entry to the Sportage lineup with its rearview camera, 17-inch alloy wheels, power features, and an 8.0-inch touchscreen infotainment system with Apple CarPlay and Android Auto compatibility. A new S trim is next in the lineup and adds sporty styling and upholstery plus blind-spot monitors, though no more power or handling chops. It’s one we’d skip. 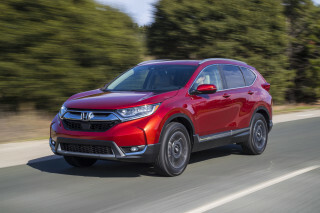 The mid-grade EX trim adds 18-inch wheels, dual-zone climate control, heated front seats, a power driver’s seat, blind-spot monitors, rear cross-traffic alert, leather, and an extra USB port. An additional package adds a panoramic moonroof, heated steering wheel, LED interior lights and more, while the Technology Package adds Harman Kardon audio and navigation. We think a Sportage EX is the smart buy here, but we'd stop short of adding the option packages. The SX Turbo tops the range, with plenty more power from its boosted engine but a much higher price than the LX. 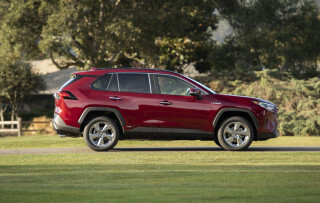 It’s a decent value given its features and underhood muscle, although it’s costly for a small crossover SUV. All-wheel- rive is optional across the range for an extra cost, and while it does improve traction for those living in areas with slippery weather, the fuel economy penalty is significant. Kia’s warranty is excellent as well, including 5 years or 60,000 miles bumper-to-bumper and 10-year, 100,000-mile powertrain coverage. The 2020 Kia Sportage suffers from lackluster fuel economy and no hybrid is available. The base Sportage is rated at 23 mpg city, 30 highway, 26 combined with front-wheel drive and just 22/26/23 mpg with all-wheel drive. Most rivals do much better. The Sportage SX doesn’t fare any better, managing 20/28/23 mpg with front-wheel-drive and a downright embarassing 19/24/21 mpg with all-wheel-drive. Regular unleaded fuel is needed even for turbo models, which should help alleviate the penalty at the pump slightly.